I've found a new periodic table, and to some extent, I am converted. Now this one's just fine for most purposes, but it gets a bit confusing when you're dealing with electronic configurations of elements. for the first three periods (rows), you can tell which shell the outer electrons are in because it's the same as the number of the period, so for instance, phosphorous's outer electrons are in the third shell, because it's on the third period. unfortunately for my students, and chemistry students across the world, once you get to the fourth period, things go a bit wonky. For instance, iron (Fe) has it's outer electrons in the third shell, despite the fact it's on the fourth row. in fact all the element in that part of the periodic table (the d-block) have electrons in the shell one LESS than the period they're in, so ruthenium (Ru) has it's outer electrons in the fourth shell. When we get to the f-block (the bit hanging underneath which actually belongs between barium/radium and lutetium/lawrencium) things get wonkier, since the outer electrons are now in the shell TWO less than the period, so uranium has its outer electrons in the fifth shell, not the seventh. the new form of periodic table is the only one i've ever seen which is simple, lists the elements in order of atomic number AND allows a student to easily figure out the electronic configuration. it does this by cleverly adding a 3-D "step" at the junctions between the blocks. it's also vertical, which is unusual too. Now the diagram contains some extra stuff that's beyond the scope of this discussion, but i'd be happy to explain it if anyone's interested. What's cool is that the numbers at the bottom represent the shells, rather than just an arbitrary label for which row the elements are in. slightly freaky is that the blocks actually fit inside a tetrahedron, due to some math i don't totally understand yet. There's a bunch more discussion at this website but basically it means that finally the periodic table doesn't just suggest at the relationships between the elements, it actually embodies them in its shape, perfectly. That is amazing. I wish I had of delved more into chemistry, but even to someone with surface knowledge that is just cool. you should see the range of different periodic tables available. there's a list somewhere online of the different varieties... there are spirals and squiggles and 3-d shapes and all sorts. Most of them follow some of the rules and trends that the elements follow, but i think there's only a couple, possibly only one which follows ALL the rules. So why didn't they use this in my chem class? Anything to make that subject a little easier to understand would have been a big help. I understood it (the old table) well enough to get a decent grade, but it wasn't easy. the trouble is that all those who deal with the decisions around this kind of thing are so very very used to the IUPAC version, the old one, that they'd HATE to have to change over. The change is the difficult thing... for instance if we tried to change it now, would all the students in their second year have to suddenly start using the new one in their third year? 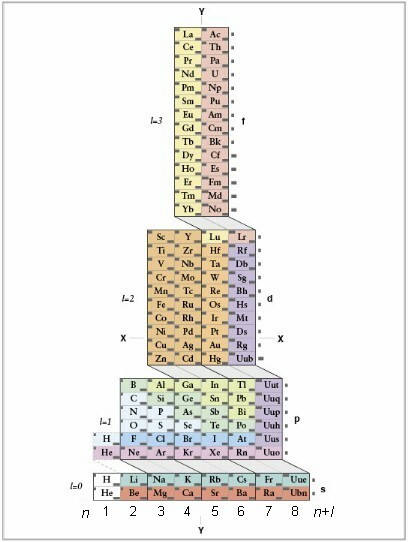 The old one still has advantages too, i think, although in the future it would probably be good to change over, especially if the g-block elements turn out to actually exist, which would require all sorts of changes to the IUPAC table, whereas the new one would just get taller. I don't understand why they can't suggest both. Maybe proffs can give a short lecture on the new one, but still use the old one for exams and such... or give the option atleast. For our first year we had the proffs make up a two-page info sheet, why not include the easier to read table with that? Maybe they just havent' taken the time to look at it.. I intend to do exactly that, this coming academic year. i will teach and examine using the old periodic table as is expected, but I will give a short lecture on the advantages of the new one, which will help them understand the tricks they have to use to use the old one. Did Harper Just Take Afghanistan off the Election Table?? Conference brings Iran and US to the same table, at last.